Without fruit, not bearing fruit; sterile: The fruit tree is strictly acarpous and will not bear any more fruit. 2. Moving, going, or growing upward. 1. Sloping upward; an ascent. 2. Rising as a hillside. 3. An upward slope, as of ground. 1. Not having a head or a clearly defined head: Earthworms are obviously acephalous insects. 2. A reference to being without a leader or chief: After the chairperson of the Board of Education resigned, the Board was acephalous until an interim replacement was appointed. 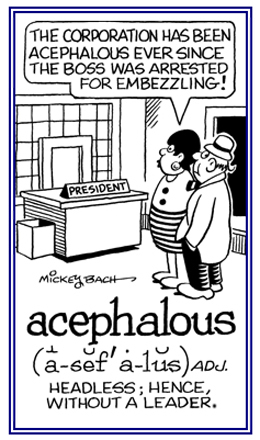 3 Etymology: from Greek akephalos (via Latin), "headless"; from a-, "without" + kephale, "head" + -ous, "characterized by, of the nature of". © ALL rights are reserved. 1. Pertaining to being able to exist in an environment that is typically poor in nutrients or which has a high proportion of silica or quartz. 2. Characterizing genetic individuals which can only thrive in conditions which are very sour or bitter. 1. Slightly sour, sourish, sub-acid; somewhat acidic: The salad chef created a tangy, acidulous dressing for the salad. 2. Cutting and sharp in speech or tone; harsh: Based on Cory's acidulous remarks, there were those who suspected that she was angry with the person she was referring to. 3. 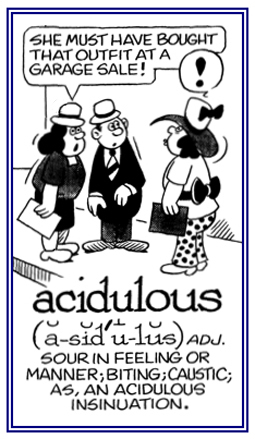 Etymology: from Latin acidus, "sour". © ALL rights are reserved. 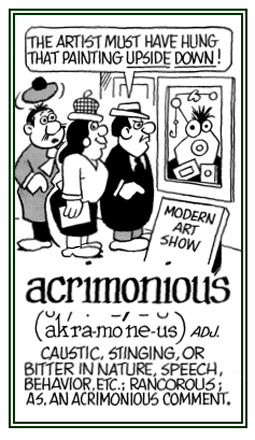 A reference to being formed like a short, curved sword: "There are some plants that have acinacifolious leaves." Descriptive of a hunger for the consumption of grasshoppers and/or locusts. Most of the locust's natural enemies; primarily, beetles, flies, and wasps are neither numerous enough on the ground nor mobile enough in the air to challenge vast swarms of locusts. Birds regularly attack locusts, but their effect is only marginal. African kites drop from the sky and they barrel-roll through the swarm, grabbing locusts with snaps of their beaks, then they climb high to peel off again. Growing only at the tip or apex of a leaf or blossom. Bearing fruit at the end of the stalk, as some mosses. Showing page 2 out of 23 pages of 337 main-word entries or main-word-entry groups.